What can Hygrozyme do for your plants? More than you think! Hygrozyme is an organic naturally derived organic solution, specifically intended to facilitate the removal and expulsion of dead organic matter that may have built up on media or medium surfaces – without altering the normal course of decomposition. Hygrozyme acts as a facilitator-cleaner prior to or in conjunction with the sterilization of containerized media, such as plastic mesh, soil, rock wool, coco fibre or agricultural related equipment, including, but not limited to, greenhouse tools, hydroponic systems, air stones, pipes, pumps, buckets, drip feed systems, and reservoir tanks. Hygrozyme is the only known natural cleaner in the market that is sterile (bacteria free) and inert. Hygrozyme is produced in accordance with ISO standards (International Standards Organization) and is considered to be of medical grade quality.The technology was identified and originally developed for hospitals. It is now considered to be the world "Gold Standard" of passive cleaning in virtually all hospitals for the purpose of cleaning surgical operating equipment. It has been proven that chemicals alone will not remove dead organic fixatives prior to sterilization. 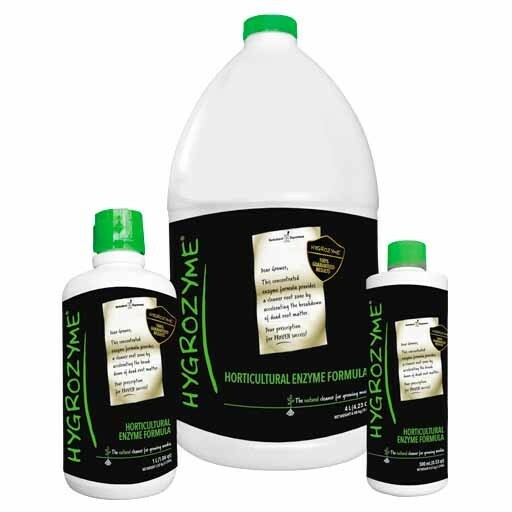 Hygrozyme is the only known natural cleaner that can be used in conjunction with other standard cleaning chemicals (i.e. hydrogen peroxide). It can be used alone, where the use of chemicals is prohibited or not welcome. Hygrozyme provides the ideal natural cleaning solution. 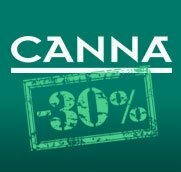 Using 2 ml per 1 litre, results have shown up to 30% reduction in grow time with a high quality increase. Using 2 ml per 1 litre, results have shown up to and between 30% - 50% increase in the rate of growth. Examples have shown a decline in grow time of up to 30% with a healthier crop, demonstrating a longer sustainability at the retail market. Using 1.5 ml per 1L, with following results: The average height of plants came to over 4 meters, thickness of stems measured between 8 - 9 cm in diameter. The head of the sunflower measured up to 60 cm in diameter. The seeds were over 1 cm in size. Kernels inside were oversized and hardly any empties were observed. Using 0.5 - 1 ml per 1L, results have shown that plants developed massive foliage and grew to a height of 4 meters. Thickness of the stems increased dramatically, and texture became more fibrous. Harvest was increased by over 60% and quality and size of tubers was excellent. Hygrozyme is an excellent solution to be used in the cutting and cloning process. 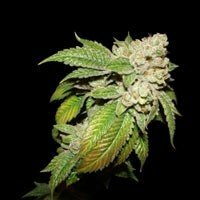 It can be used either alone, at 1.5 ml per 1 liter or in conjunction with a preferred cloning compound. Tests have shown that in its presence an expedited growth occurs up to 30% faster than with conventional methods. 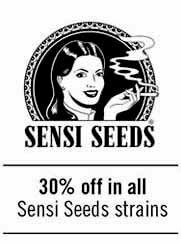 If used from seed it is most effective in use right after seed germination. Again, CSRI tests showed a robust development and the usual result was up to 30% faster development than conventional methods. Hygrozyme is compatible with all standard cloning and cutting formulas and may be used in conjunction with other solutions or alone. In tests reviewed by the Canada Science & Research Institute (CSRI) Hygrozyme has been proven "excellent" in maintaining longer use of slabs and hydroponic solutions. An increase of up to 30% in longevity has been experienced. In soil, Hygrozyme has proven to increase soil porosity through accelerated breakdown of dead organic matter. Its chief function is to vigorously rid the medium of dead organic matter, thereby preventing disease from setting into the medium. As a media rejuvenator, it is used after a harvest as a soak solution and should be applied after a 50% hydration is implemented. At a concentration of up to 2.5 - 3.75 ml per 1 litre a rapid and almost complete reduction in dead bio mass can be observed. 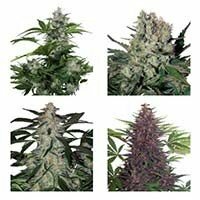 Available nutrients are unlocked in the process and, depending on the circumstances, may provide an excellent source of available plant energy for future growth. Hygrozyme is a highly refined enzymatic cleaner facilitator for dead matter. Keeping in mind that it is sterile and inert, Hygrozyme cannot kill anything. Its key role therefore is to act as a prophylactic. Many leaf borne diseases like Black Spot, of Powdery Mildew flourish in the presence of dead matter. Transferred by humans, macro organisms or air borne arrival, these diseases can set in quickly when in the presence of dead matter. The regular use of Hygrozyme can be a deterrent by removing dead matter and at the same time fostering the presence of beneficial micro organisms on leaf surfaces and in the grow medium or hydroponic solution. This is especially the case in combination with compost extracts that contain micro protagonists. For best results it should be used right from the start of a clean system to maintain those conditions. Applications at a rate of 1.5 ml per 1 litre are sufficient. Hygrozyme has been proven in maintaining the visual appearance and ongoing health of a wide variety of cut flowers: roses, mums, lilies, orchids, etc., as well as a large variety of harvested produce. By using Hygrozyme during the growing cycle, produce (e.g. fruit, vegetables, herbs, etc) will stay fresh longer and appear visually attractive and healthy. This will significantly reduce the amount of spoilage. CSRI tests for cut flowers showed that by adding Hygrozyme to a daily change of water, they are able to last in excess of 14 days (with proper cutting and removal of dead leaves). Another unique quality of Hygrozyme is, that it is the only known product in the market that can be used in conjunction with Hydrogen Peroxide in a ppm of 1-2% solution. By adding a 1-2% hydrogen peroxide solution, the results were even more pronounced. The function of Hygrozyme in pure hydroponic systems is one of acting as a refined natural facilitator/cleaner. Hygrozyme aids in the removal and conversion of dead organic material by facilitating and expediting the natural breakdown progress. What normally might take weeks can be accomplished in minutes with the presence of specific natural enzymes. In a closed hydroponic system are many factors which can facilitate the development of disease. The build up of dead matter is usually the contributing factor to this common problem. A build up of dead organic matter occurs in pipes and pumps, where "pockets" for dead matter may exist. Usually this occurs where 90˚ turns are used in piping as well as in air stones and in pumps. This build up of dead organic matter can provide ideal conditions for blight to set in. Cleaning these bio films can be and is a difficult process once the system has been left unattended for even a short period of time. In some cases, only a few minutes or seconds in an area of the system which has less than 6 mg per litre of oxygen can spawn a septic environment. Bio films are difficult to clean. Many experts believe that disease formed may actually enter surfaces of old and decaying plastics and continue to appear even after apparent sterilization, since "dirt" cannot be sterilized. Already accepted as the "Gold Standard" in the medical industry of surgical instruments, enzyme formulas have now been proven effective in hydroponics. Used from the outset (as directed) – when starting from a clean system – Hygrozyme will help prevent the build up of bio films leading to disease. Hygrozyme is effective in helping to keep the surfaces of pipes, pumps, reservoirs, and trays free of bio film build up. REMEMBER: Hygrozyme does not kill anything. To be effective, it must be used before dead matter can develop and "grab" onto surfaces causing bio film build up - just like fire insurance for your home that must be purchased before the fire. As Hygrozyme is the only known market solution that can be used in conjunction with hydrogen peroxide in a ppm of 1 - 2% solution, some operators use this combination to clean, sterilize, and oxygenate roots. Hygrozyme is a naturally derived, and sterilized enzymatic formula. The product is a natural "catalyst-cleaner-facilitator" aiding in the breakdown of dead organic matter. It is not systemic to plants. Its function is to help speed up the natural decomposition process and "unlock" complex energy for easier access to the plant.